Over the past year, the Mr. and I have gotten used to being away every weekend camping. So when the camping season came to an end, we weren’t entirely sure what to do with our weekends. We have taken to coming up with Weekend Adventures. I have decided to start writing posts here in our journal to share our adventures with all of you. On a recent Sunday, we ventured out to try out a small local coffee shop for breakfast that we had never been to before. 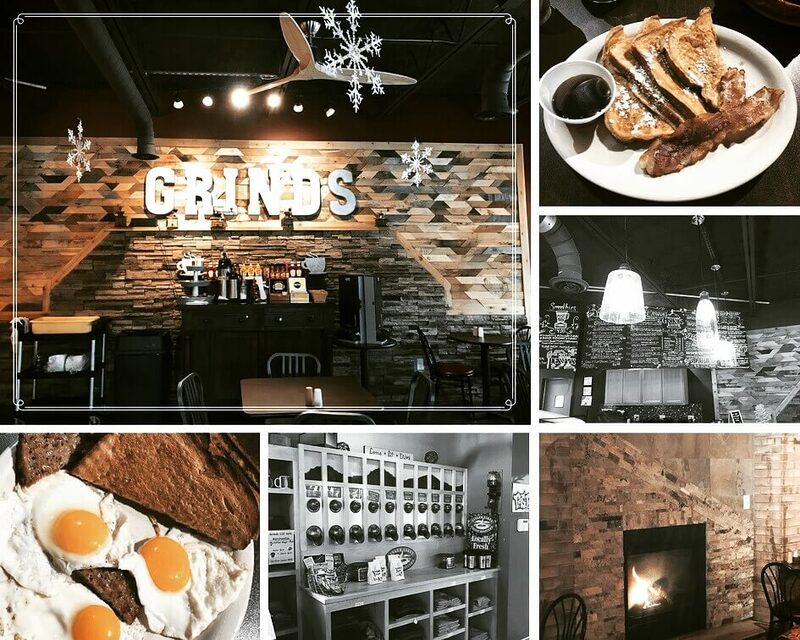 We visited Grinds 122 in Brockport, New York. It was a small café with an excellent industrial atmosphere. The staff were very welcoming and friendly. We placed our order at the counter, got our coffee and went to find a table. We chose a table in the back section of the café by the fireplace. It was a cozy little spot next to a section of comfy chairs and a couch. There was a small group enjoying that space and I can see that area being in high demand. While waiting for our food to be brought out to us, we enjoyed our fresh brewed coffee and spent some time looking at houses on-line. We haven’t officially put our house on the market yet, but are in the beginning stages of browsing. Now that we are empty nesters, you would think that we would be looking to downsize. While we are most likely looking to purchase a ranch style home, we are actually in need of extra space as I would like to increase the size of my in home art studio along with my photography and print studio. The Mr. has a few wants of his own as well. Some acreage would be nice along with a very large garage or out building. We will keep you posted on how our house hunting journey goes. We aren’t in any major rush and are planning to take our time looking until the perfect one comes along as we are planning for this to be our last move. We didn’t have to wait long for our breakfast to be brought out. The service we received was excellent and as you can see by the pics, the food was good sized portions and very tasty. It was a wonderful way to start off our day. We will definitely be back to visit again soon!